Mario Kart 8s rerelease has rolled onto the Nintendo Switch. Of course, its good, but how good? Read on at Kidzworld to see just how much we loved racing around the Mushroom Kingdom. Mario Kart 8 Deluxe is the rerelease of the best racing title to hit the Wii U, this time bundling in all of the DLC and unlocking every character right from the start. And who would've guessed, it's still fantastic. Back when the original game hit the Wii U, here's what we had to say. 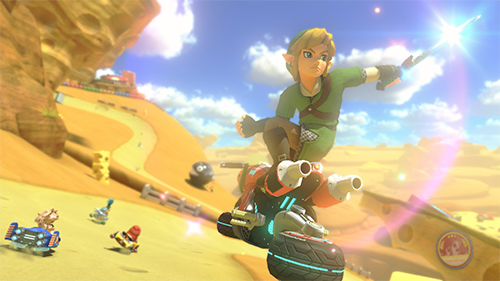 "Along with Super Mario 3D World, Mario Kart 8 is the best reason to own a Wii U so far. 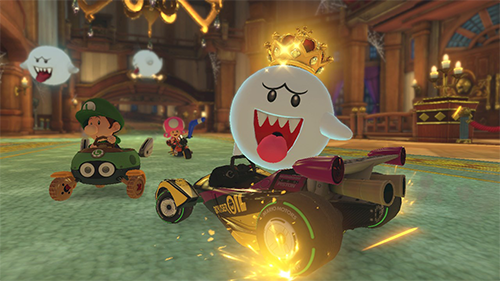 Nintendo pulls out the stops with Mario Kart 8, creating a wonderful kart racing experience from top to bottom. Stunningly beautiful across 32 exciting tracks. Mechanically perfect gameplay. 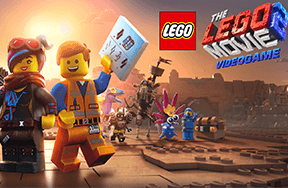 And some of the most competitive and fun multiplayer you can have on your couch this year. 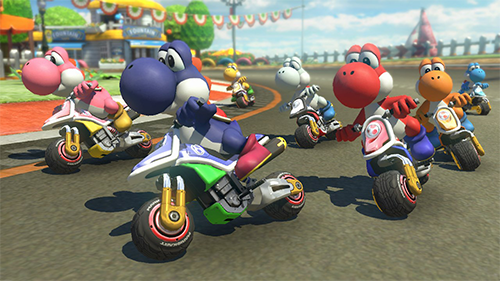 Mario Kart 8 has been worth the wait, becoming an instant classic entry in the much adored Mario Kart series." 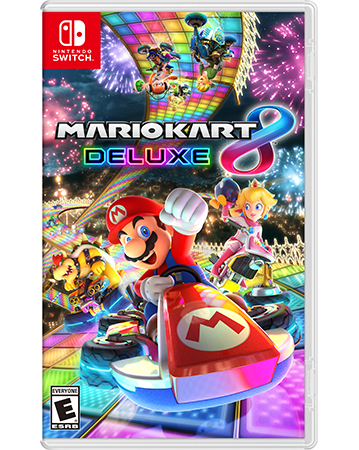 All of that is true of Mario Kart 8 Deluxe but slightly smoother graphics, an awesome Battle Mode, and extra content adds icing to a cake that's already overflowing with frosting. Each race in Mario Kart is full of split-second decisions. Do you use your item to attack or defend? Boost around the far corner or hug the inside? Take the shorter path along the slow grass or keep your speed on the longer road? Making decisions at the drop of a hat will decide your race, as well as a bit of random chance when you're waiting for your new item to be revealed. But that's all been true of any Mario Kart game and if you've never played one before then congratulations on getting out from under that rock, gaming has never been better! Unlike the original release on the Wii U, Mario Kart 8 Deluxe gives you access to almost every character right out the gate... almost. Unlocking car customization options are still hidden away until you've grabbed an appropriate amount of coins but you won't be at too much of a disadvantage as the regular kart will do the job. Similar to Gamecube's excellent Mario Kart: Double Dash, you'll be able to hold onto 2 items at a time in this iteration of Kart. Really those small changes add up to an awesome package, especially when you bundle in the small graphical updates on the Switch, but the most welcomed new addition is the game's revival of Battle Mode. 8 courses, 4 of them recreations of past tracks, usher in the return of the series' beloved Battle Mode. 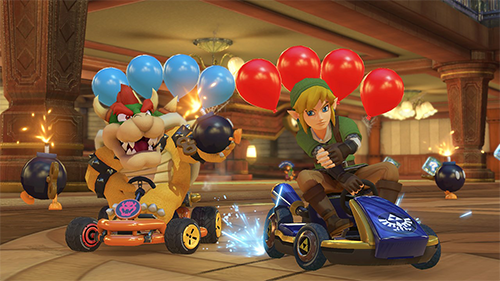 Rather than the simple Balloon Battle of yesteryear, Mario Kart 8 Deluxe has 5 different Battle Mode types. 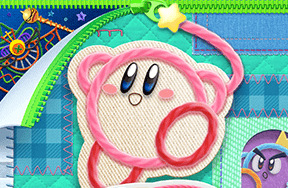 The different battles are all pretty varied, grab the most coins, pop the most balloons using only Bob-ombs, etc. It's almost enough to forgive Nintendo for leaving it out the first time... almost. We've all been there, playing a game with someone who doesn't really seem to comprehend the controls. You've finished your race and are patiently waiting for your opponent to cross the finish line but they've fallen off the track for the millionth time. Mario Kart 8 Deluxe's Smart Steering is one of the smartest solutions I've ever seen for a problem that I never thought would have an answer. With Smart Steering turned on, which it is by default, your driver will take turns more accurately without falling off the course. This isn't a fully fool-proof method and you'll rarely find yourself tumbling off the world, especially if an attack sends you flying that way. And for those concerned about beating players who are abusing this feature, use of Smart Steering cripples the ability to effectively use their Drift Boost and shortcuts that require leaving the beaten path are nearly impossible to access. It's a trade off but one that gives any player the option of being a pro player. Mario Kart 8 Deluxe takes the best and makes it better. The original's awesome collection of courses, characters, and customization are only enhanced by Smart Steering and the welcomed return of Battle Mode. If you're a Switch owner you'd be doing yourself a disservice by ignoring the new gold standard in kart racers, Nintendo or otherwise. Are you a Mario Kart fanatic? Did you play the Wii U version? Share your comments below!